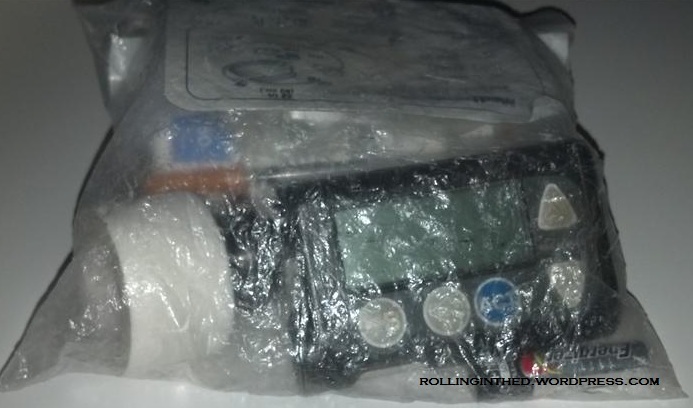 This is my new insulin pump. Her name is Epsilon, and I haven’t even taken her out of the box yet. Her parts have been reincarnated refurbished from an earlier life as an insulin pump. I have no idea what that life was like or what led to her premature demise. She’s here because my previous pump, Delta, experienced Motor Errors on the past two consecutive Sundays. Delta, herself, is a factory-refurbished model. She was hired as a fill-in pancreas in July, after Gamma decided she didn’t want the job anymore. This is what got Delta fired. I had always been a bit suspicious of Gamma. She was my first factory-reconditioned pump; my first time being a foster dad to a pump who was unwanted by her natural parent. She was also quite noisy when she bolused. But I adopted Gamma because Beta, the Revel that she was, happened to be on crack. I mean, she cracked, and I knew it was just a matter of time before she disappointed me. When I got Beta, she was brand spankin’ new. Just born. She was my very first Revel, and oh, how I loved her. She had a built-in CGM. She asked snarky questions like “Are you disconnected? Yes/No”. When she gave a vibrating alert, it sounded and felt like the car next to me was blasting Snoop Dogg a bit too loud. When it comes to children or employees, I’m always willing to give a second chance. But when it comes to an inanimate object that is my life support, I’m not quite as forgiving. So when Gamma arrived, Beta was sent to the place where old pumps go to get refurbished, wherever that is. Alpha lived by my side for many years, faithfully pumping insulin with nary a worry in the world. No glitches, no worries, nothing. She served me reliably, well past her end-of-warranty date, confidently shirking Medtronic’s warning me that she was out of warranty and needed to be replaced NOW. Eventually, though, I gave into the warnings and upgraded to a newer model with Continuous Glucose Monitor abilities, sadly demoting Alpha from her starting role to “backup” status, where she lives now. You never forget your first, and Alpha was my first. She never let me down. Sometimes I feel like I should’ve stuck with her. I would be able to CGM, but I wouldn’t have to answer dopey questions like “Do you see drops at the end of the tubing? Yes/No” either. She now has a permanent home in my Emergency Backup Ziploc, just in case. Ol’ reliable. Another rep assured me that it is a new pump, that it was never used by anyone else. She then went on to clarify that the case was new (because once you open up a pump case, you can’t close it back up again), but the parts inside may have lived previously inside of a different pump. But it’s all thoroughly checked out and is absolutely one hundred percent A-OK. Apparently, it’s the case that defines the pump, not the guts. But when I asked her why one of my replacement pumps had a lower serial number than the one it replaced (see the Beta-Gamma photo above), she was stumped. Maybe serial numbers aren’t issued in order. Odd, since that’s what I thought “serial” meant. And Motor Errors? As I mentioned earlier, I’m a forgiving person. I try to believe that these things really do get thoroughly checked out. But a Motor Error, as I learned at the end of the Gamma era, is caused when the pump’s piston isn’t lined up precisely with the number of units left in the reservoir. So maybe, just maybe, since Revel can deliver insulin to the precision of 25 thousandths of a unit, it’s a little more sensitive to piston position. The earlier line of pumps, including my beloved Alpha, only could deliver to one-tenth of a unit precision. So if Alpha’s piston was off by a hundredth of a unit, no one would be the wiser. But if a Revel is off by that much, it gets angry. This is just my personal theory. Who the hell knows. 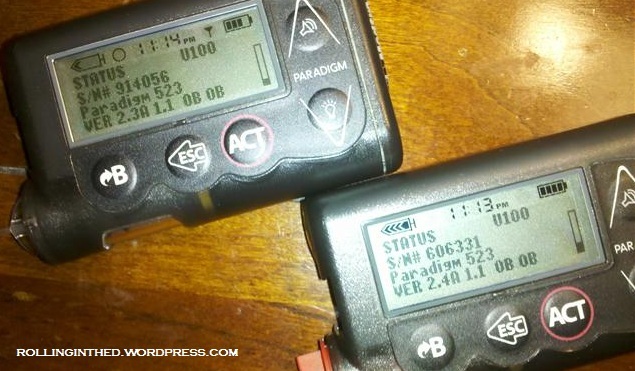 I have no facts or anecdotal evidence to back it up, and the science behind Insulin Pumps is all Greek to me. But it makes me a little more tolerating of the Motor Errors. 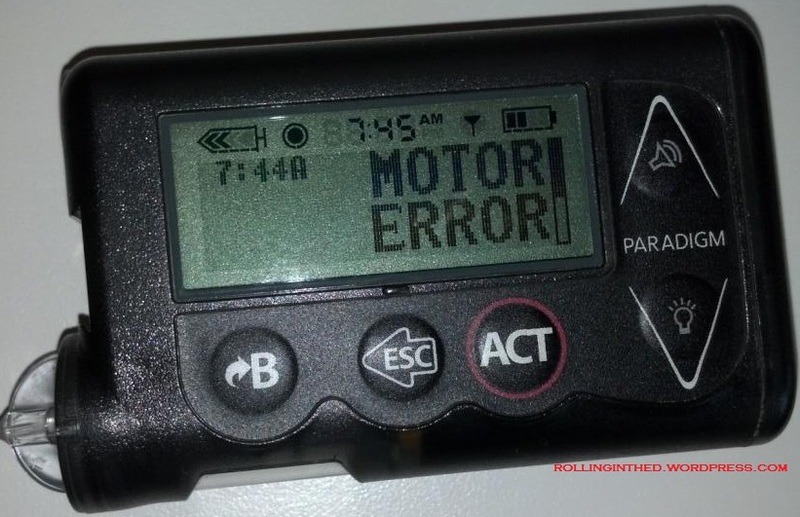 Because I love Medtronic pumps that much, and while these occurrences sometimes make me want to consider switching, I’m not willing to give up my built-in CGM or Carelink Pro charts. But when it comes time for pump Zeta to step into my life, we’ll see how I’m feeling at that moment. I’d rather not think about it right now. Those Carelink Pro charts are really incredible. I don’t need to log anything, ever, it’s all stored in the pump. One of these days, I’ll blog about that. 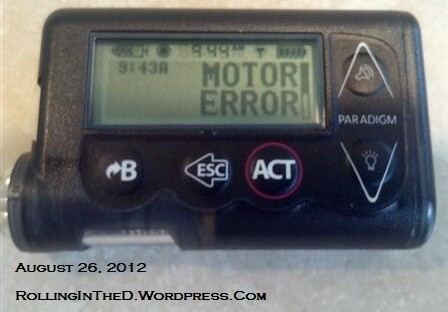 Posted on September 7, 2012, in Diabetes, Insulin pump, Personal and tagged Medtronic, motor error. Bookmark the permalink. 10 Comments. Welcome to the world, Epsilon! Or, at least, to Scott’s. I hope this one works without any motor errors! “Kentucky”. Ahhh I wish I didn’t just laugh so hard. Sorry about the pump issues but a great post! I expect nasa quality engineering cuz these things cost as much as a spaceship! I don’t know much about pumps, thanks for sharing your pump’s histories. I really appreciate it! Dude, I’m right there with ya on those Pro reports. I’m nearing the end of my pump trial, and the biggest thing that stood out for me was the information that can be gleaned from those Pro reports.